Note: This is an older edition of the Best Climate Solutions Award. All information about the current edition is available on the Award Section of this website. Communication is becoming an increasingly essential tool to inform and engage stakeholders and the public, as well as to build collaboration bridges, scale up and empower innovative solutions to the challenges posed by climate change. The scientific evidence of climate change is mostly unquestioned. Impacts on ecosystems and communities are more and more observed and felt. Global climate policy reached a significant milestone with the adoption of the 2015 Paris Agreement. Experiences and examples are multiplying of people joining forces to make their communities more resilient, as well as of cities, countries and business models undertaking the path of low-carbon growth. Although the reality of climate change is acknowledged, communicating solutions or strategies to act and address cause and impacts remains a difficult task. However, new digital communication strategies inspired by information sharing, cloud-based and mobile technology, virtual reality and advanced gamification provide powerful tools to reach, inform, and engage key audiences such as younger generations, as well as to build networks and connections to produce real change. Youth face a future where climate threats and impacts will be increasingly critical and are the ones that can make a significant shift in enhancing current and future response. The role of youth in combating climate change presents a tremendous untapped potential and could make the difference in local, national and global decision-making. In the current highly connected and diversified world, there is no “one-size-fits-all” approach to win the challenge of climate change communication and no boundary to develop new ways of presenting climate change threats and opportunities. For these reasons, the aim of the Best Climate Solutions 2018 Award is to showcase and promote the most creative and impactful initiatives designed to deliver engaging messages, raise awareness and trigger action in the audiences addressed, such as students, consumers, business or politicians. 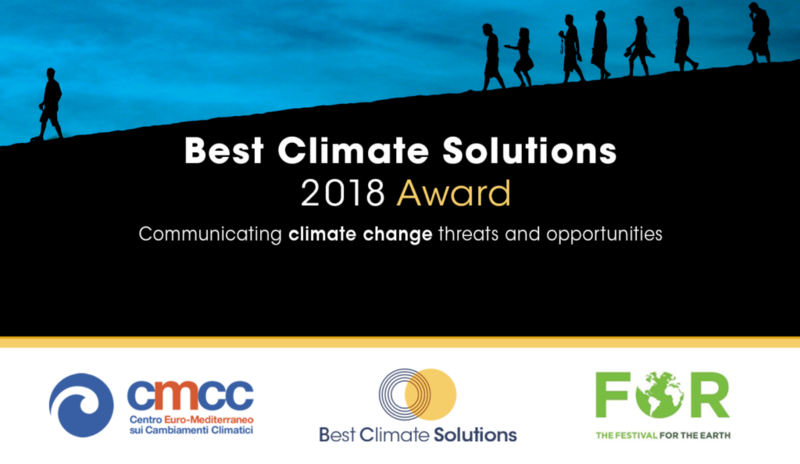 The Best Climate Solutions 2018 Award focuses on innovative ideas, methods, and tools to communicate climate change in education, advocacy, media production and social engagement activities. The 2018 edition featured 42 shortlisted candidates from all over the world. Read more about the 2018 candidates. The Best Climate Solutions 2018 Award was organized by CMCC Foundation Euro-Mediterranean Center on Climate Change in partnership with the Festival for the Earth. The prizes were kindly made available by Greenfid, main partner of Festival for the Earth. The evaluation process includes the assessment by a high-profile Jury composed of experts from universities and international organizations, and online polls open to the online community of the Best Climate Solutions platform. Read the full bios of the jurors available here. Admitted candidates are graded with a score combining the results of the online polls and the assessment by the international Jury. The author of the submitted project or idea receiving the highest score is awarded the prize. Submissions that do not meet the minimum score by the Jury cannot win the Award. The finalists and the winner of the Best Climate Solutions 2018 Award have been announced on December 4, 2018, at the Festival for the Earth 2018 in Venice. The project Climate without Borders has been selected as the winner of the Best Climate Solutions 2018 Award. A Special Mention of the Jury was accorded to the project Climate Tracker. A second Special Mention of the Jury has been granted to the project Climate Feedback. The authors of the winning projects have been invited to present their proposals during a high-level event featuring Nobel, Pulitzer, and Goldman Prize winners. The prizes, worth three thousand euros for the winner and one thousand euros each for the Special Mentions, were made available by Greenfid, main partner of Festival for the Earth. Read the press release about the Best Climate Solutions 2018 Award’s final results and the 2018 Jury’s joint note.